Bugs love your restaurant. The warmth, the lack of cats and other predators, and the protection from rain and other harsh elements. It’s a true safe haven. And they especially love it for all the food. They like the warmth. They appreciate the relative lack of fluffy or feathered predators, though they (like most of us) would prefer it if there were fewer eight-legged crawlies around. They like that your ceiling doesn’t spit water, hail, and snow at them. And they love it when you’re messy. Mr. and Mrs. Patterson knew all this before they opened their restaurant. Yet they had a million tasks and responsibilities each day—worrying about pests all the time just wasn’t an option. But even before their grand knew the moment they began construction of their quaint bed & breakfast in the middle of almost-nowhere, tucked away between rolling hills, opening, like most restaurant owners, they’d already become that they were a prime target for constant insect invasions. But the good news for them was, they were already protected. You see, instead of using their hectic schedules and busy jobs as an excuse for ignoring potential bug infestations, Mr. and Mrs. Patterson decided to safeguard their restaurant with Everlast Epoxy flooring. That way, they could go about their business of running their eatery, without every having to worry about bugs again. So when the very bugs pictured above left signs of their presence, the Pattersons were far from surprised. But neither were they all that bothered. At first, the bugs had high hopes—when they first wandered in at lunchtime, the food smelled incredible. They imagined all of the delicious crumbs that would soon get wedged into cracks and crevices…then, when the customers and staff went home, they would pick them up and burrow themselves underneath the floorboards and have a delicious feast! Then they would start families, build nests, and live the dream bug life…all on Mr. and Mrs. Patterson’s property. But these critters didn’t count on Everlast Epoxy Floor. Unlike wooden floors or tiles, the Everlast Epoxy Floor was seamless—there weren’t the usual cracks or openings to catch and hold bits of food until they had a chance to feast on it. No sir! And with the top notch moisture protection, the entire epoxy floor was always dry, leaving not so much as a puddle of water to drink from. Needless to say, they were not happy. And Everlast Epoxy Floor was so easy to clean! Even the hardest working bug had literally zero chance of coming across so much as a ketchup stain, or bit of dried barbecue sauce to nibble on. No, everything was always immaculate and spotless, exactly how bugs hate it. Nor was there anywhere for them to hide—not a single cozy crevice. Over time, they’d become used to restaurants with loose floorboards and baseboards, which created lovely spaces for them to crawl into, and eat, sleep and raise families. But those were nowhere to be found in Mr. and Mrs. Patterson’s place. In fact there wasn’t a single penetrable flooring surface for them to use in the entire restaurant. By the end of opening day, the bugs were already running scared. With nowhere to hide and nothing to eat, instead of living the “dream life” (which would have been a nightmare for Mr. and Mrs. Patterson), most of these critters were left to starve to death very quickly. And any that did manage to survive the famine remained constantly exposed, and easy to vacuum or sweep up, before they ever had the chance to multiply. And the worst part of the story? These bugs found out that the Everlast Epoxy Floor was built to last! Mr. and Mrs. Patterson’s floors held up for many years, with absolutely no breaks, cracks or chips to speak of. What was an honest, hardworking bug to do, but find a different restaurant to be their safe haven! After all, restaurants always held the potential for a bounty of crumbs, spills, and bitty pieces of fruit wedged in places where the humans wouldn’t find them. If everything went well for them, the bugs would be able to burrow between floorboards or beneath baseboards and establish themselves as permanent residents. There, the soft smells of old food would waft through the cracks, delighting their senses in the same way that our own taste buds are tantalized by the scent of fresh apple pie. 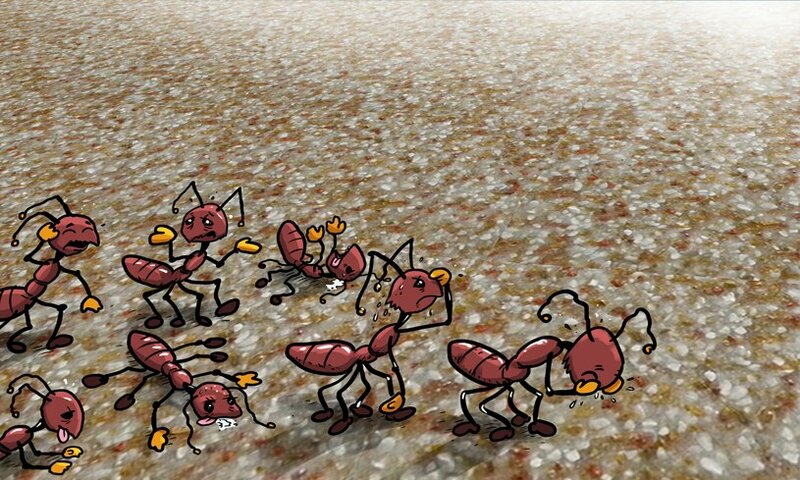 They would start families inside their burrows, becoming so plentiful in number that they couldn’t go anywhere without running into another bug. And then they’d reproduce some more. Or so they had hoped. They soon discovered, however, that nothing good awaited them in the Pattersons’ kitchen. No matter where they went, there was nothing to eat and nowhere to settle down. Trapped atop the expansive (well, expansive to them) stretch of floor, they became disoriented and wandered aimlessly until Mrs Patterson sucked them up with her trusty vacuum. Such is the fate of all bugs who dare to invade a room with an Everlast Epoxy Floor.